This project has received funding from the European Union’s Horizon 2020 research and innovation programme under grant agreement No 761030. The EU is the world's leading producer of beet sugar, contributing to approximately 50% of the total. However, the European sugar industries face important challenges, threats even, from societal changes (e.g. reduced sugar consumption due to increased health awareness of consumers) and changes in market regulation (e.g. fall of the sugar quota in the last quarter of 2017, including expiration of the iso-glucose quota). As a consequence, consumption of sugar (sucrose) produced in the EU is projected to drop after a short increase. CARBAFIN helps the sugar industries and their allied partners to address these important challenges. 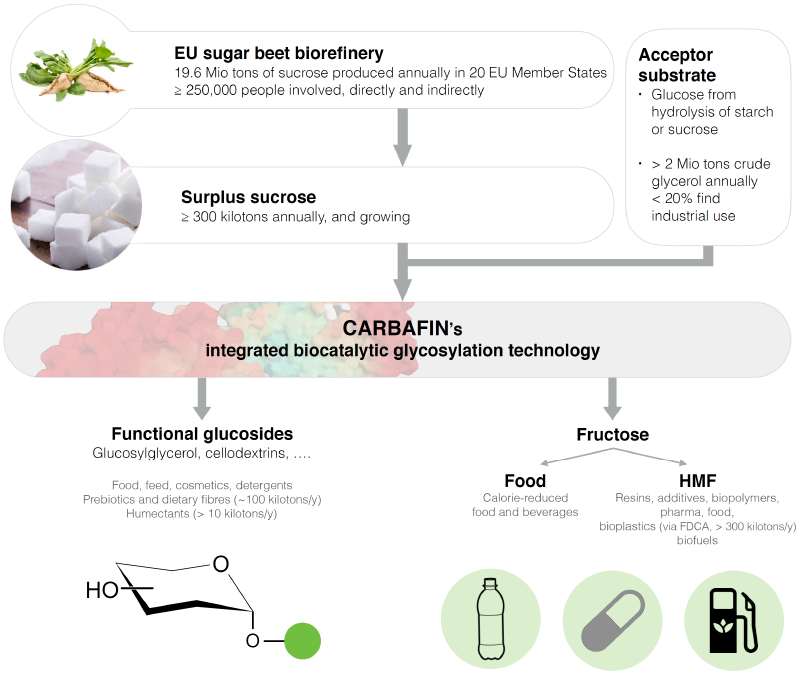 The biocatalytic production technologies developed and optimised in CARBAFIN will allow them to find innovative uses for sugar beet biomass through new value chains in a bio-based economy. CARBAFIN proposes a two-platform biocatalytic conversion ("biorefinery") of surplus sucrose from sugar beet. Products are functional glucosides, here demonstrated for glucosylglycerol or cellodextrins, and fructose, here investigated as the precursor for the platform chemical 5-hydroxymethylfurfural (HMF). In more detail, glycoside phosphorylases, engineered as industrial glycosylation biocatalysts, will convert the glucose part of sucrose into innovative functional glucosides (platform 1). In parallel, the fructose part of sucrose will be exploited as substrate for production of HMF, a valuable platform chemical for the bio-based economy or as calorie-reduced additive in food industry (platform 2). This two-platform biocatalytic conversion will be fully integrated with efficient downstream processing (DSP) methods, which will ensure the economic viability of the proposed value chains. 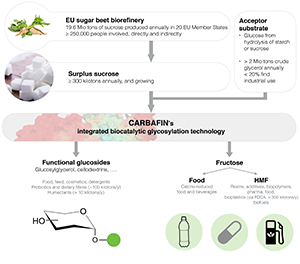 CARBAFIN processes, and the products derived from them, will have sustainable large-scale applications in food and feed, cosmetics and bio-based plastics markets. The content of this website reflects only the author's view, the EU-Commission is not responsible for any use that may be made of the information it contains.